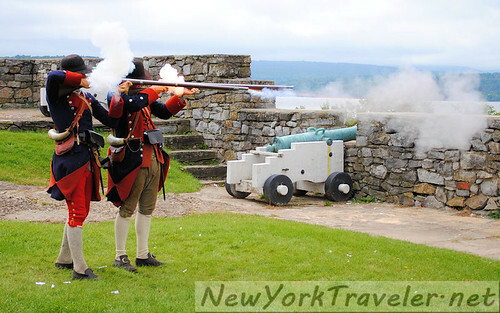 Fort Ticonderoga, an historic site in New York near the Vermont border (Lake Champlain) has everything: breathtaking views of the Adirondack high peaks, walking paths through gardens and restored pre-colonial buildings, hands-on stuff and lots of climbing and exploring for the kids, and oodles and oodles of ancient history– well, as ancient as America can get: Iroquois Indian arrowheads and French settlement from the late 1600s. We’d visited the Fort Ti grounds once before, sneaking in after the place had closed for the season. We walked the leaf-strewn trails and peeked over the stone walls. We didn’t see any of the interiors of the fort or the buildings, as the places were locked and we didn’t dare intrude that far. We had gotten a healthy taste of the incredible landscape, however, to taunt us for a return visit. Which, I am happy to report, we did this autumn. 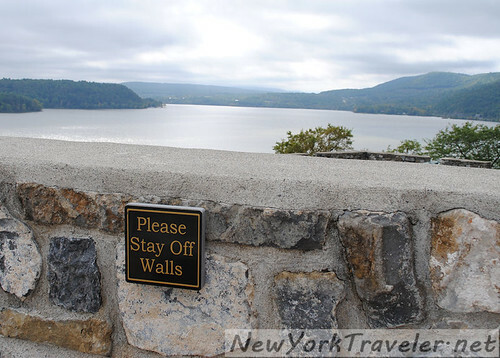 After walking through the admission area and gift shop (which is loaded with stuff and I spent a bundle of money in it), you walk down a small hill that faces the south side of the fort, toward the bottom of Lake Champlain and the top of Lake George. The views are simply staggering. 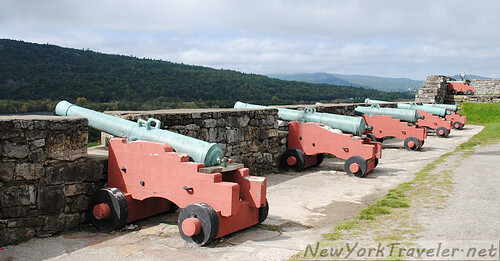 Brigades of cannons line the perimeter of the fort’s stone walls. It’s like strolling through a castle. Actually, in the United States, stone forts are as close as we can get to a castle! 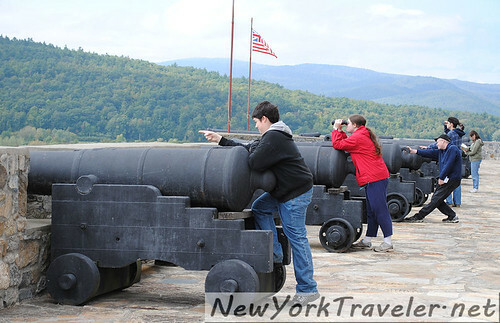 Fort Ticonderoga has the largest collection of cannons in the country. 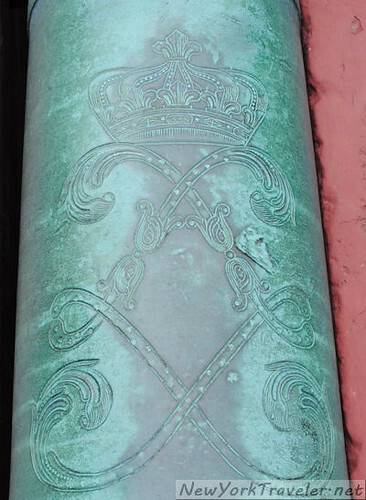 The older ones are very ornate, with inscribed dates, decorations, and sometimes a motto or phrase or the name of the king under whose reign the cannon was built. The American flag flies here, but the site has seen the French fleur-de-lis and the British Union Jack fly overhead, as well. A few plaques hint at the history of the fort as we meandered the perimeter of its walls. Our wonderment was interrupted by a crowd gathering in the green. Two finely dressed soldiers marched to the center and called for attention. A musket drill! 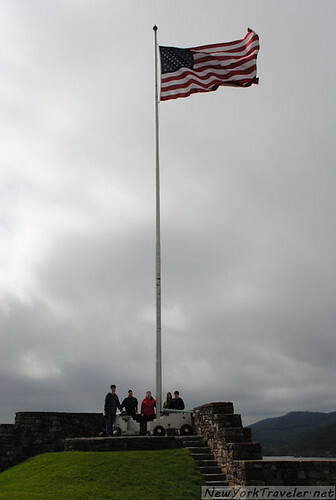 This fort was originally built and occupied by the French in 1755, during the French and Indian War*. They called it Fort Carillon. In 1759, it was successfully captured by the British, after their previously failed attempt in 1758. 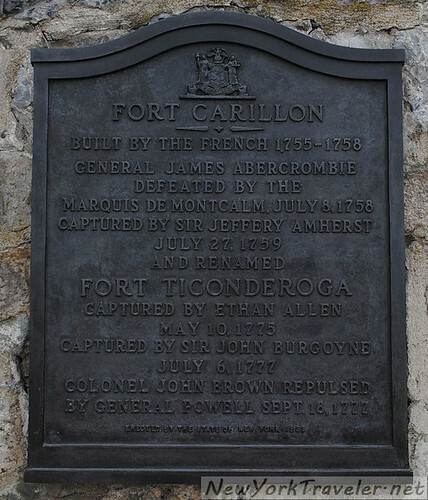 They re-named it Fort Ticonderoga. 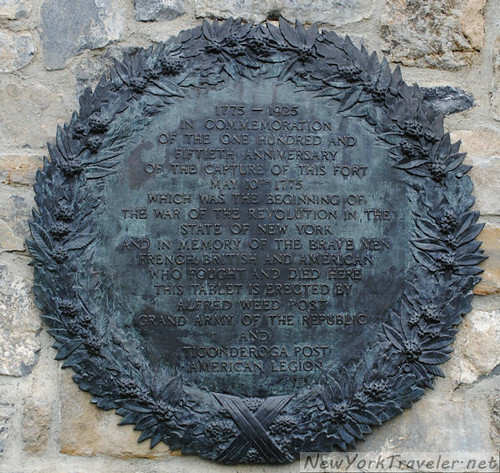 Being occupied by the British, it was then captured by American revolutionaries in 1775. Then, just over 2 years later in 1777, it was successfully re-captured by the British. “Wow, this was a busy place,” I thought. It intrigued me as to why this place would warrant such attention, so that it would change hands 3 times it in the first 22 years of it’s existence. Doing a little research, it gradually sunk in that the reason for it’s popularity owed to the 3 major selling points of all real estate: Location, location, location. The fort is situated at the southern end of Lake Champlain, on it’s western shore. Lake Champlain, a long, narrow, north-south oriented lake, together with Lake George and the Hudson River, forms an important travel route which runs from New York Harbor (under British control at the onset of the French and Indian War) to the St. Lawrence River (then controlled by the French). This route was familiar to, and used by, Native American Indians even before European explorers discovered it during the early-to-mid 1600’s. It is relatively free from obstacles and includes only a few portages**, of which Ticonderoga is one. 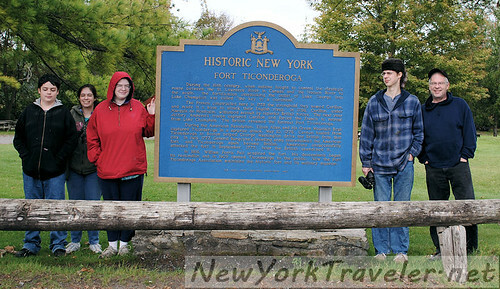 The name, “Ticonderoga,” itself gives us some local geographical information. The word is derived from what the Iroquois called this area, and which means, “(the) land between two waters.” The two waters are Lake Champlain and Lake George, and the land between was the portage. Despite there being a river connecting the two lakes, the winding 3.5 mile long La Chute, knowledgeable travelers chose to make a portage here because the La Chute was full of dangerous white-water rapids. It was safer and more practical to cross on foot at a point where about 1.25 miles of dry land lay between the lakes instead. The French therefore, chose to build the fort here to control the southern end of Lake Champlain, up which any British invasion would have to come. * the war between Great Britain and France in North America from 1754 to 1763. ** a portage is a point in a water route where boats and/or cargo need to be carried across land to avoid obstacles, or to get from one body of water to another. So Fort Ti was obviously a very strategic geographic point, as it controlled the waterway. 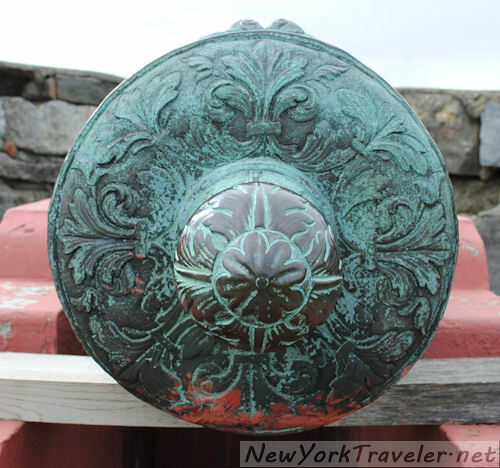 I’ll continue more about our adventure here with Fort Ticonderoga, Part 2 in the near future. This time, we got to go INSIDE the buildings and see some very amazing artifacts!